The Noorderzon 2014 edition is in full swing again with lots of activities, interesting eating and drinking locations and of course art, theater and lots of music. Having missed the first two days I started on Saturday with a few terrific concerts. Reading up on the acts that Vera / Lepel Concerts had planned for this evening, I didn’t have much doubt on whether to go or not. So I headed back to Groningen once again. Noorderzon is well underway and actually already halfway. This is also my first day of 4 weeks of vacation. Had a few things to take care of, but I absolutely wanted to attend today’s edition of Noorderzon. When I arrived I was astonished to see the enormous line of people waiting to get into the Ophelia tent, where the performance “Post Presents Post / Who’s the best?” was about to start. I saw Gabby a while ago in De Oosterpoort. A lovely gig for a rather small selected crowd, but a very energetic and good humoured girl that easily won over the audience. So I was thrilled to see she’d be back in Groningen and on the main stage of Noorderzon no less. I was very curious to see how that would work. I didn’t know the band (hardly ever listen to radio and can’t remember when I last actually watched MTV, does that even still exist? 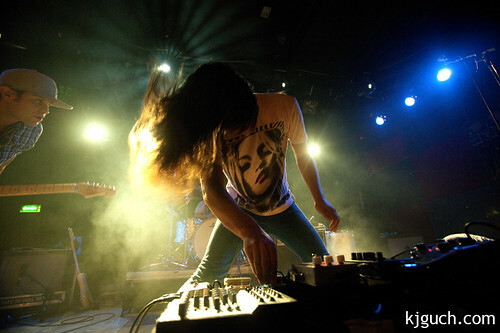 ), but I do have my antennas out for interesting names and Of Monsters And Men raised a buzz. And so last night I -finally- went to Noorderzon. 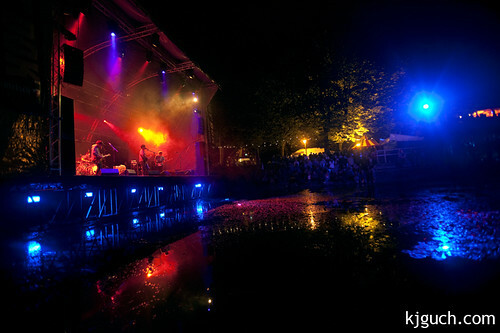 It’s late August and after a summer stop Noorderzon in Groningen marks the beginning of the second concert season. It’s a great festival with lots of art, theatre and of course: music. I wasn’t able to attend much this year, but I was not going to miss Irene Wiersma on Sunday August 21 and having Frank Turner on the same night was just bliss. 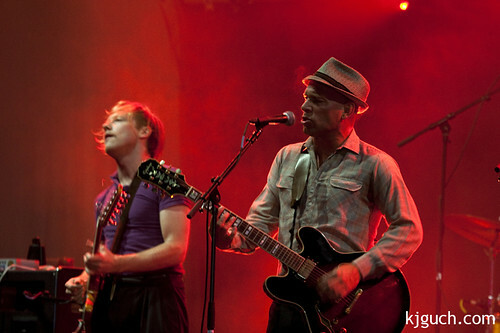 My last night at Noorderzon took me to two bands that both showed a lot of fun and enthusiasm on stage. First I headed to the Spiegeltent. I was a bit too late and found Don Fiasko already fully at it and had already won the crowd over. It’s hard to describe this rowdy crowd. On Internet I found them to be described as an afro-latino-electro-kitsch fanfare and I guess that will do for a large part. Personally I’d add a Japanese cabaret group somewhere in there. After the gig it was quite a hike to get to the Noorderplanstoen in time for the next gig; Sleepy Sun on the Dok stage. Of course when I got there, it was very crowded all around the pond, but I slowly made my way to a spot where I at least was able to take some pictures. Last night I went to Noorderzon again (it lasts 11 days but I can’t attend them all). This evening had two other new and interesting bands for me. 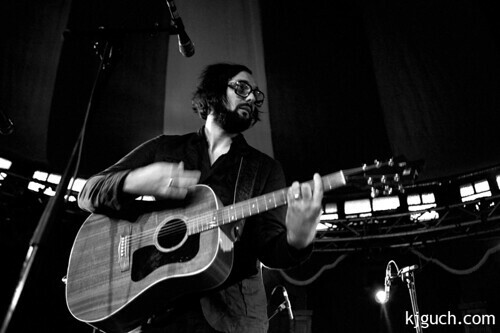 First of back to the Spiegeltent again for Dutch singer/songwriter Blaudzun (named after a Danish cyclist). The venue was already well filled when I got there, but luckily I managed to squirm myself in there and found a low angle front-row place. It was steaming hot in there, so wearing a long sleeved shirt was maybe not such a good idea. 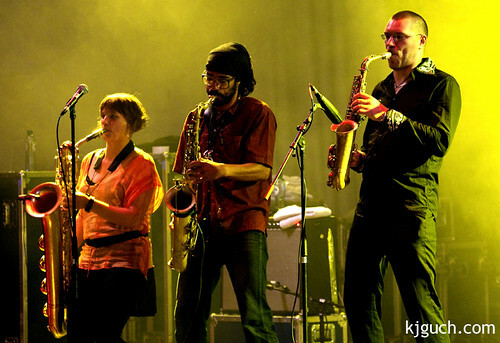 It’s been nearly two months since I last saw a gig, so the start of Noorderzon 2010 was much anticipated. 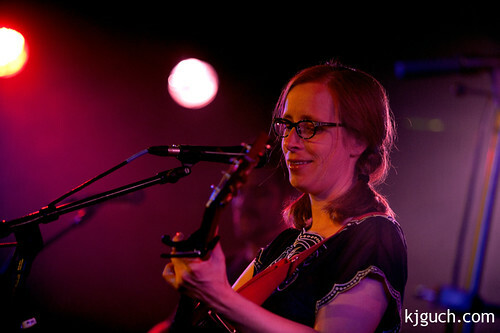 Opening act (for me at least) was Laura Veirs and the Hall of Flames playing in the Spiegeltent. This gig had sold out well in advance and after picking up my tickets at the Kiosk I stood in a long line awaiting the opening of the tent. 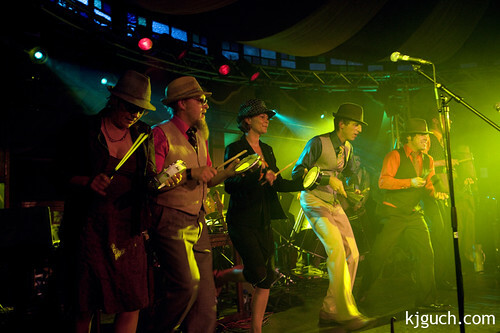 The Spiegeltent hosts paid-for concerts, but at the festival area there’s also a great autdoors free gigs stage, the Dommelsch stage Het Dok. 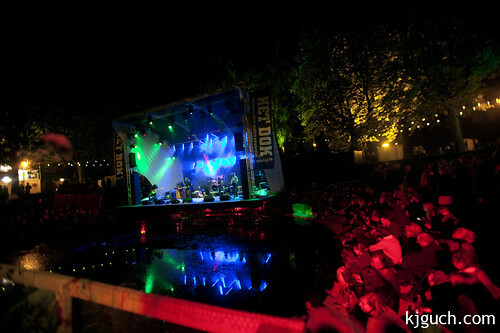 This stage is set at a pond, the audience is to sit along the shore of the pond. It puts you way back from the performing band, but the view is fantastic.